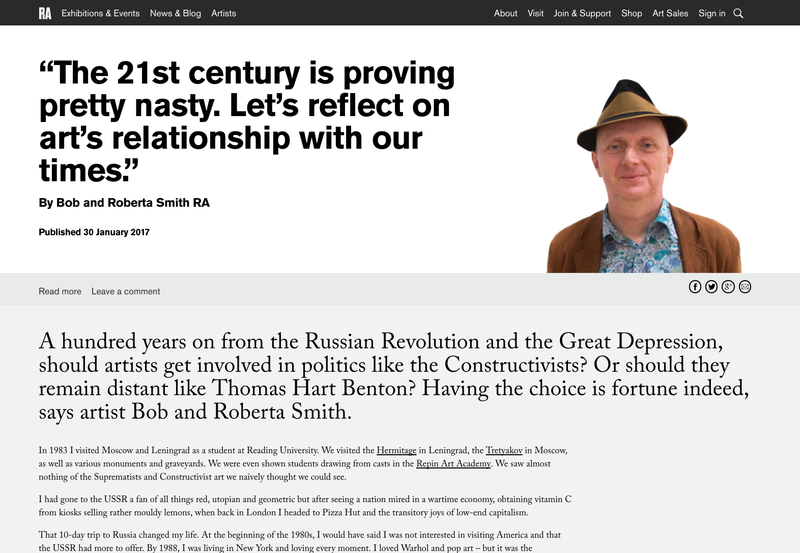 In the run-up to the RA’s 250th birthday in 2018, last year we took on a project to overhaul our website and social media content. A lot of research and ideology went into the development and roll-out of the strategy – but its essence is that we’ll reach new audiences by being genuinely valuable, not by telling our audiences we’re valuable. In practise, it was a process of stopping everything we publish online and starting again – this time with our values, objectives and audiences at the core of everything we do. (Please note: To avoid providing too much duplicate information, the URL provided above shows an earlier draft of the strategy that we used to workshop with department around the RA to develop our new content, to give an idea of the process; the latest iteration of the strategy is outlined below). We started with a period of research on our online output between 2014-15. We discovered that we had produced over 365 pieces of editorial content – and that 65% of it had been viewed less than 500 times. For context, our most viewed article has been read over 70,000 times – so we could see clearly that our content wasn’t performing well. We discovered too that on social media, although a huge amount of resource was going into it, much of what were producing was not resonating with audiences. Engagement was low. We were struggling with resource and internal tensions, too. Departments across the RA understandably felt strongly that their projects should be covered online, that they should have as much prominence as other departments – but there was little reflection on why we were doing it, and most staff at this stage had no digital training or understanding of analytics, no awareness of what had or hadn’t been successful in the past. The digital team had an ongoing pile-up of mixed quality articles and heavily sales-led social posts to produce, and poor results to show for it. 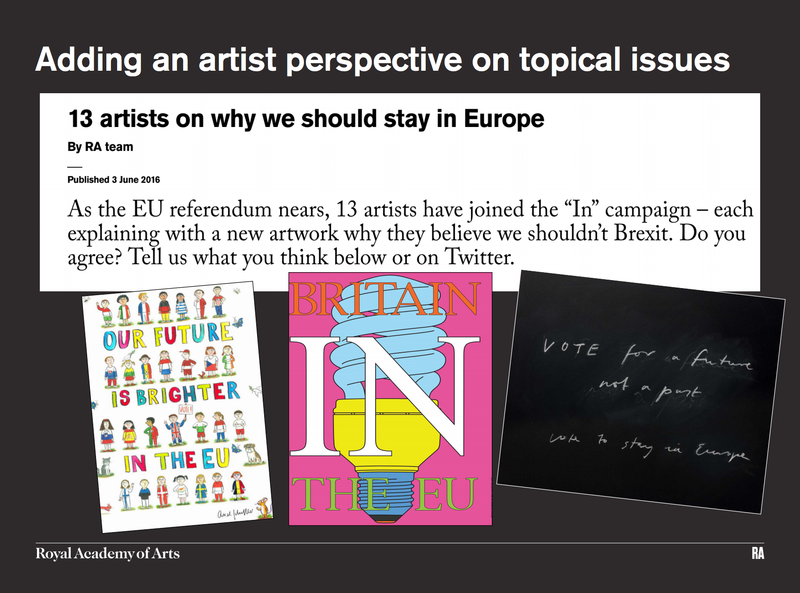 I came to the RA from a journalism background, and arriving at the gallery, I was quickly aware of the (understandable) difference in our approach. Thinking about the example of newspapers and magazines was helpful for us: we realised we weren’t acting like a trusted authority, providing a service as newspapers do for their readers, and as we do for our gallery visitors. Online we were operating as a “brand”, albeit a charity, pushing out messages we wanted people to hear. We realised that if we want to have a presence beyond the gallery, to be part of a wider conversation, that standpoint had to change. During this research phase, we drew up a list of most successful and least successful on a basic level – article views and social media engagement. Naturally, the promotional, the inward-looking, the event reports, were the poorest performers. Those articles and posts that encapsulated ideas – where we provided something of value in itself to our audience, without trying to sell them something – tended to perform best (the URL provided above shows further details of this research, as part of a workshop presentation to departments). We also looked at the digital landscape as a whole. Some unsurprising but important finds arose to share with our colleagues: over 80% of our target audiences are on Facebook. These audiences are readily consuming content about art elsewhere online: The Guardian, The Huffington Post, The New York Times. The average person has 76 “sessions” on their phone in a day. 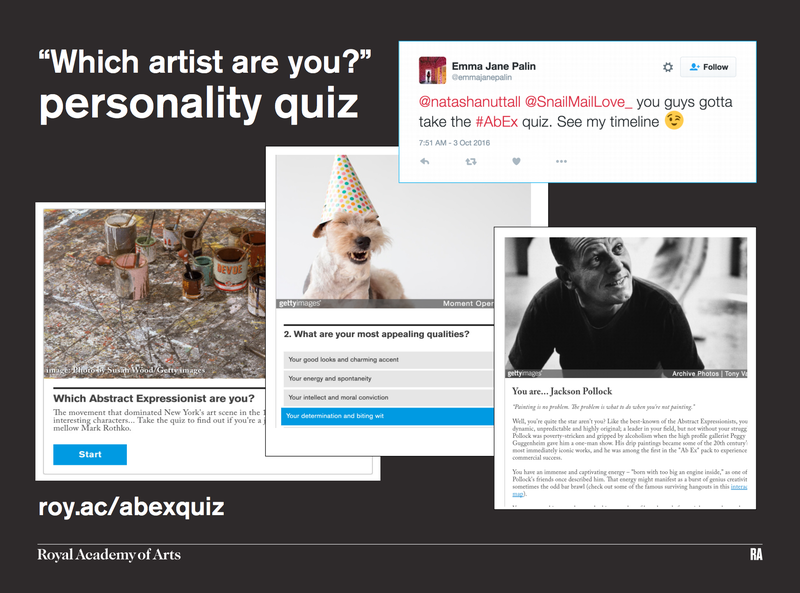 44% of young people in America say they discover art through social media. These were just a few of the findings that helped crystallise the importance of this project for us and helped us make our case internally: the RA must find new audiences and diversify to ensure its future, and in 2017, digital has to be a fundamental part of it. We can’t carry on treating digital like a loudspeaker we pick up at the end of a project. It has to be a living, breathing part of our mission. We then looked at our goals: in more concrete terms, what can digital actually do for us? Our overall digital strategy concurrently laid out these four objectives: grow our audience, deepen our relationship with them, convert them into customers and retain those relationships and customers. Having those objectives laid out for the first time was a key part of the puzzle: every piece of content should be trying to achieve at least one of those four things. We realised quickly too that, while we have a very committed core audience, trying to achieve “grow” meant thinking a lot more rigorously about who else we’re trying to speak to. 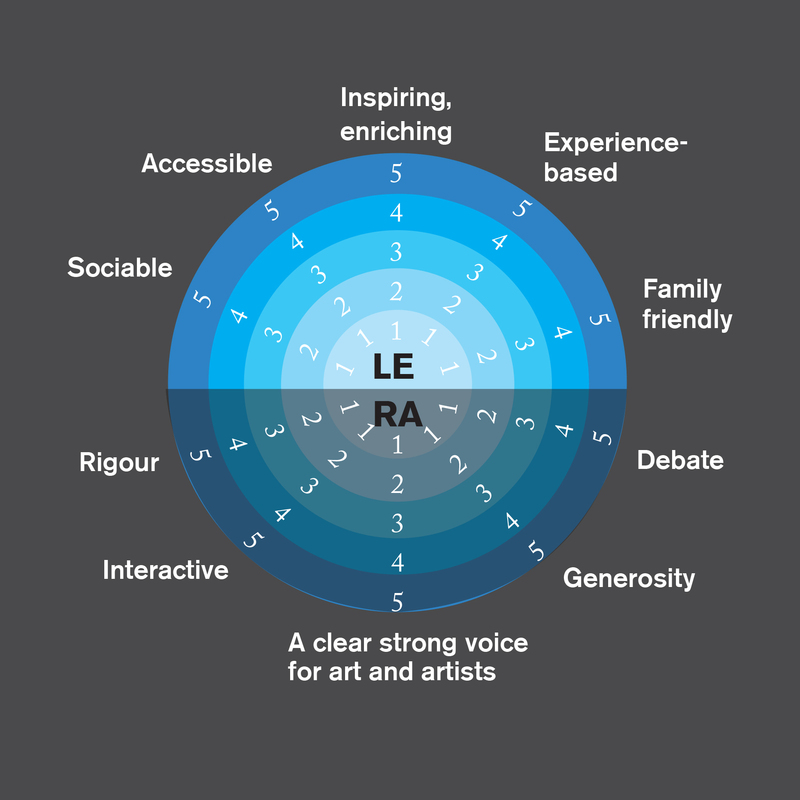 Over the previous year, the RA had mapped out its three key target audiences – that existing core audience, and two more slightly younger, art-interested audiences who we think could be engaged by what we do. 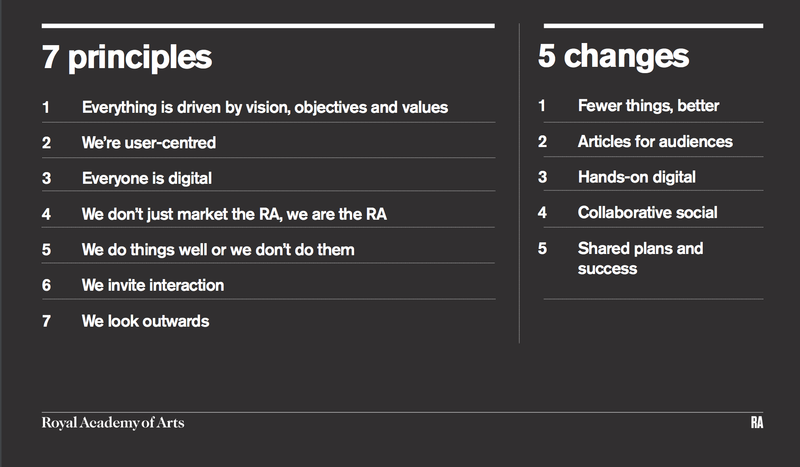 Taking the view that digital should be integrated into the RA’s overall strategy, we adopted the same nomenclature. The breakdown of interests and preferences we had on each group would form the starting point for our decisions about content. We began to think about content in two ways: what would a target reader be interested in, and how would they like to consume it? And secondly, what are our own values? Why is it us making this content? What can we contribute? We put renewed emphasis both on what our audiences want, and on who we are as an organisation, looking back to our organisational mission statement and values (a voice for art and artists; rigour, achievement, debate). 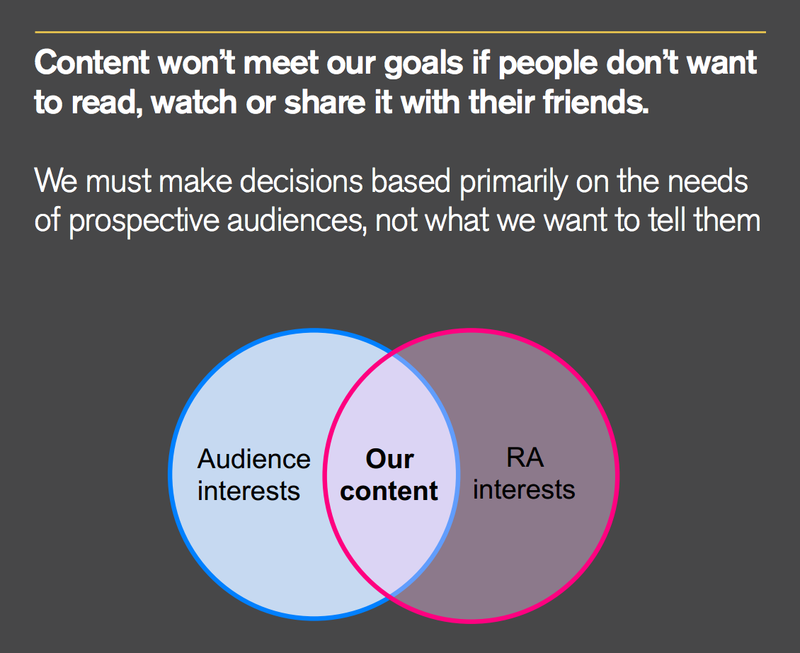 The nub of the strategy lies in that overlap of that Venn diagram; unless a piece of content serves our audience’s needs and embodies our values, there is no point in doing it. 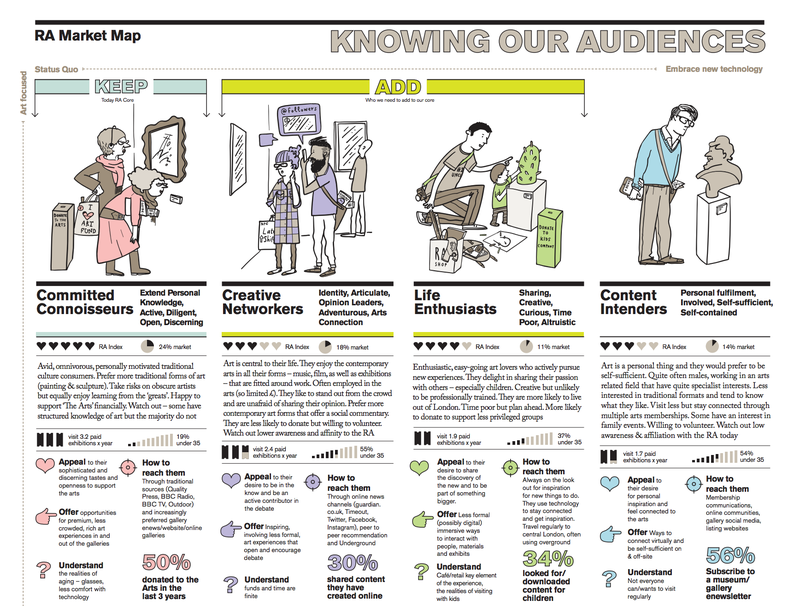 We eventually formalised this into a series of charts (right image shows the criteria for the “Life Enthusiast” segment), marked with each audience-group’s interests on the top half and our values as an organisation along the bottom. Each piece of content will be conceived with one of these three audiences in mind, and it should get a reasonable score on both sides of the relevant chart, or it’s not a good decision. With that test in place, we went back and checked our previous content against these charts: much of it catered for our core audience (although we clearly hadn’t found a way of getting it to them, hence the low readership), some of it catered for no-one, and none of it catered for those two, younger prospective audiences of ours. We needed to start being more innovative and outward-looking in our approach. We outlined a new plan for our content – 7 principles and 5 changes – embodying all of the above ideas and taking into account the internal shifts that needed to take place. This would be our new manifesto, stuck on the wall of our office and used to inform all our decisions. Again, looking to quality cultural supplements and magazines for inspiration, what came out of the strategy is a strong set of new article and video formats – each geared towards one of these specific audiences, and each with a plan of how to help that content find that audience. Some series were developed with departments who would take ownership of them, others are easy formats for departments to contribute to. 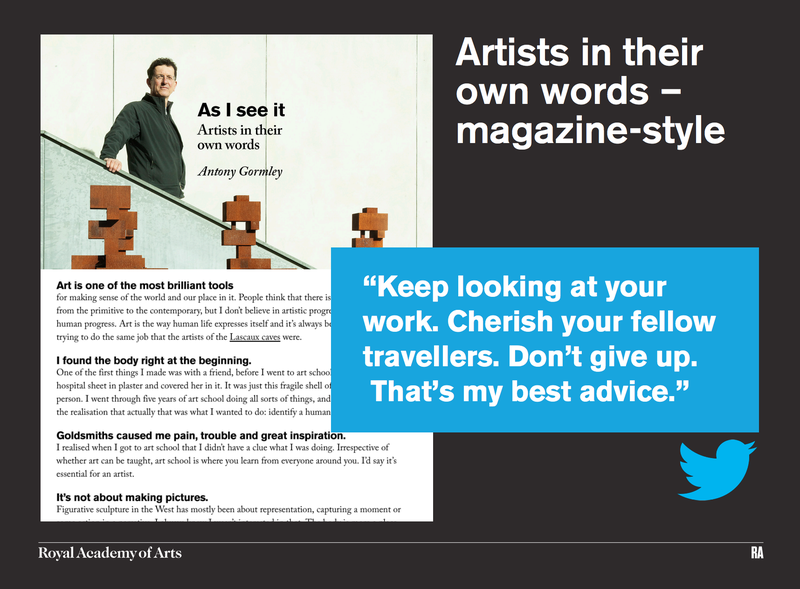 Artist’s reflecting in their own words on their life, work and lessons learnt. Aimed at creative young professionals: direct, easy to read on the go, rigorous ideas, topical. RA values: sharing artists voices and championing contemporary practise. Full of interesting quotes allowing us to share its ideas on Twitter. Accompanied by beautiful studio photography to help engage relevant audiences on Instagram. Step-by-step activity for families to do together. Aimed at families with young children, looking for experience-based content. Bright, engaging, inspiring, easy to follow. RA values: generosity and making. Targeted at relevant audience on Facebook. A video series showing the process of making a work from start to finish. Aimed at creative young professionals; focus on making and process, animated and subtitled for watching on social media. 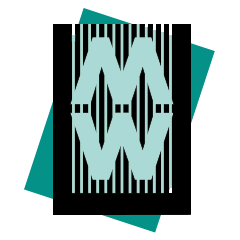 RA values: making, championing contemporary practise and sharing artists’s voices. Optimised for Facebook: animated and subtitled for watching on social, and edited into Instagram clips. Longer version created for YouTube. 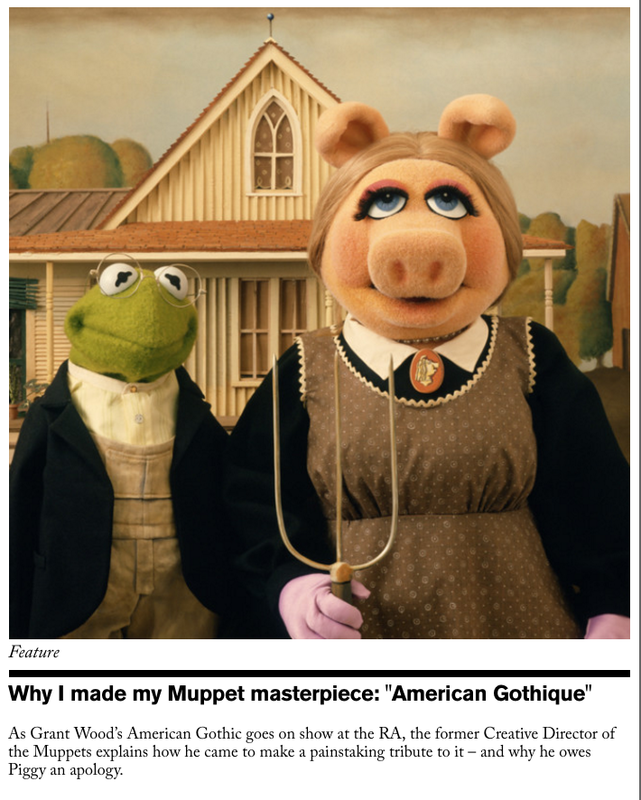 A deep dive into a work of art, explaining what it is and why it’s significant. Aimed at our core, traditional audience: very engaged with the RA collection and activities, and looking to us as an authority to provide further interpretation. RA values: authority, rigour, generosity. Shared to Friends and other RA-fans via email and social media. Aside from the above series, the audience charts have also provided us a way of communicating about decision-making with every department, and allowed them to be more creative and more empowered to develop ideas. This was key to the strategy: their expertise of staff across the RA is of course also a huge part of what the RA has to offer, so we needed everyone to understand why we were making these changes, but also to feel invested themselves; to understand what digital content could do for their part of the RA’s mission. From a technology perspective, we felt that it was vital that digital skills were spread throughout the organisation. After sharing the strategy and some social media training, we signed up to a new social media platform, Percolate, that gave us unlimited logons and had approval mechanisms. Over 30 members of staff are now contributing to our social media. Similarly, we rolled out training to our CMS so that departments could build their own content, and we arranged analytics training to encourage interest in the outcome of every piece of content. Before this project, we hadn’t been tracking anything consistently. But now with our four clear objectives in mind, we were able to identify KPIs for each one and track them on a new dashboard that we created using Google data studio. A summary page gives us top level stats against a target for each month, and a page for each objective tells us which pieces of content are contributing to each. Our first dashboard is focused on tracking editorial content; we then moved onto creating a website-wide dashboard for the same four objectives, and we’re currently working on one specifically for social media. Having these in place has made a huge difference to our output and to our culture. We are reminded to be more focused with where we put our resources, and to push for continual improvement – and importantly, to keep sharing those learnings across the organisation. The result is a dynamic editorial offer that we hope is genuinely valuable to our audiences, and which furthers the mission we exist to pursue. By harnessing digital, we can now have a relationship with a much wider span of people around the world who share our values – whether or not they can visit our renovated galleries in 2018.